Red Line Synthetic Gear Oil is designed to provide the highest degree of protection and greatest efficiency for your drivetrain. 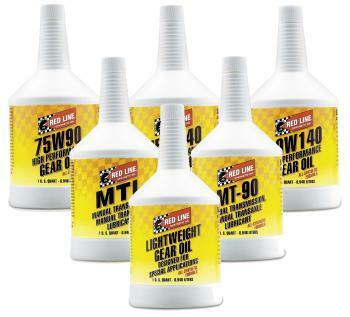 Red Line provides a complete line of drivetrain lubricants which are optimized for differential, transmission, or transaxle use over a wide range of temperatures. Proper selection depends upon the manufacturers’ requirements and whether the application is for passenger automotive, commercial, or racing use. Red Line Gear Oils contain polyol ester basestocks to provide excellent lubrication even under extreme conditions of high-loading and high- temperatures—their natural lubricity provide excellent slipperiness which reduces the sliding friction in hypoid gears to reduce wear and temperatures. The synthetic basestocks have a natural multigrade property, so large amounts of unstable thickeners are not required to manufacture our gear oils, which means that Red Line Gear Oils will provide a stable viscosity for even extended periods of use. Red Line also manufactures gear oils which can be used in limited-slip differentials without the use of additional friction modifiers. Our most popular gear oil, this is the preferred product in nearly all car and light truck differentials, both conventional and limited-slip. 75W90 is preferred for most racing applications. It contains friction modifier which is recommended for limited-slip units. 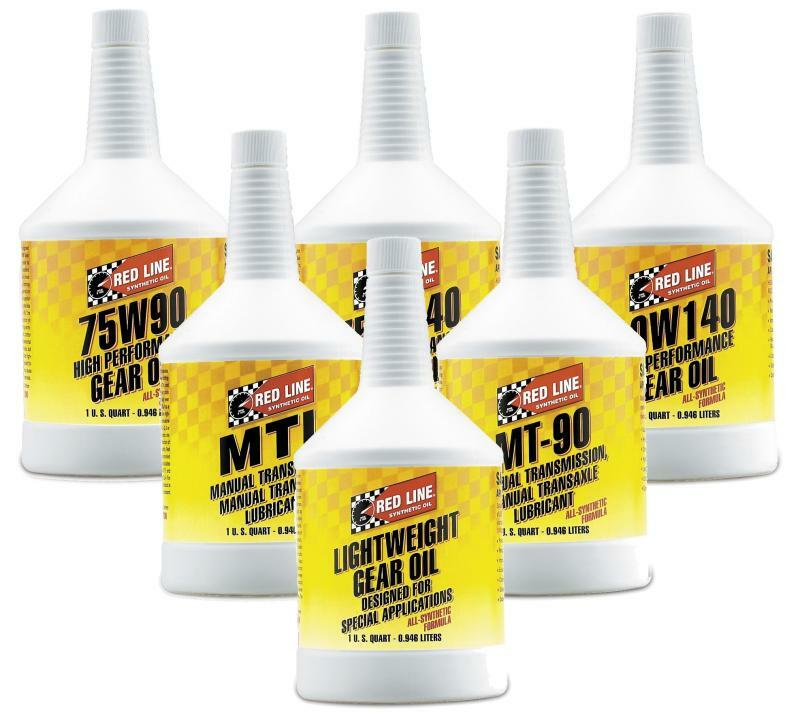 75W90 Gear Oil can be used in many transmissions and transaxles; however, other Red Line lubricants have better frictional properties for rapid synchronization. Exceeds API GL-5. Our 75W140 gear oil is a GL-5 rated product recommended for street-driven road car differentials where that viscosity is specified, providing excellent performance in both conventional and limited slip units. Popular in late-model Ford truck rear differentials as well as many other common models. Generally used in commercial trucks which will climb long, steep grades and some racing applications where power is not critical. Generally 0.5% less efficient than 75W90. Can also be used in differentials and transmissions where excessive noise is a problem and limited-slip differentials which vibrate excessively when turning a corner. Exceeds API GL-5. This GL-5-type geal oil doesn’t contain the friction modifiers for limited-slip hypoid differentials. This makes the transmission synchronizers come to equal speeds more quickly, allowing faster shifting and much easier low-temperature shifting. Can also be used in racing limited-slip differentials where weak spring design causes too much wheel spin. A heavier product what works well over a wide range of loads and temperatures, This GL-5-type geal oil doesn’t contain the friction modifiers for limited-slip hypoid differentials. This makes the transmission synchronizers come to equal speeds more quickly, allowing faster shifting and much easier low-temperature shifting. Can also be used in racing limited-slip differentials where weak spring design causes too much wheel spin. A friction-modified gear oil designed for use where 75W75 GL-5 gear oil is recommended (may be too slippery for some syncros). Used in many motorcycle applications as an alternative to ShockProof types. It has excellent low-temperature flow which allows easier shifting when cold and good synchro compatibility. May be used to obtain maximum power transfer in racing differentials which do not see high temperatures. A friction-modified gear oil designed for use where 75W80 GL-5 gear oil is recommended (may be too slippery for some syncros). Used in many motorcycle applications as an alternative to ShockProof types. It has excellent low-temperature flow which allows easier shifting when cold and good synchro compatibility. May be used to obtain maximum power transfer in racing differentials which do not see high temperatures. Compatible with petroluem or synthetic gear oils, this product will significantly reduce the friction break-in of differentials, reducing break-in temps for as much as 50 degrees F. Limited slip or positraction units will often chatter without use of this product or a gear oil with a similar modifier, so add only enough to eliminate the chatter and avoid making the plates or clutches too slippery.